Indra have partnered with OVO energy to bring you the #FutureofEnergy. On April 18th 2018, on Brick Lane, London, OVO launched 4 new products that are going to change the world of energy as we see it now. The Home Energy Storage Unit – it stores energy during off-peak periods the pumps it back into the grid during high demand periods. 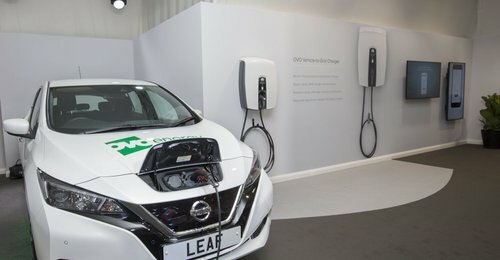 The world’s first domestic Vehicle-to-Grid charger, it allows customers to benefit from storing energy in their vehicles for use later, saving on energy costs, reduce their CO2 emissions and manage their demand profile. The Smart Charger, with a power rating of 7kW, maximises off-peak charging with its advanced scheduling to optimise grid balancing and battery longevity. The launch event was a huge success and we had the likes of Robert Llewelyn and Forbes turn up to see the unveil of the products. It was such a pride-filled moment to see all our hard work out there for the world to see!